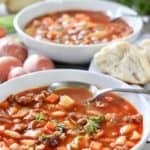 This 30 minute Chorizo and White Bean Soup is incredibly easy to make and has tons of flavor! The chorizo does most of the flavor work for you and the added fresh veggies make this a fresh and wholesome meal! When I think about soup, and I do, a lot. I think about the broth. A true testament to a great soup is not just the ingredients as a whole, but a deep rich savory broth. Most of us don’t have time to roast up beef bones or make our own chicken stock but there are ways to make great soup without all that fuss and this is one of them! 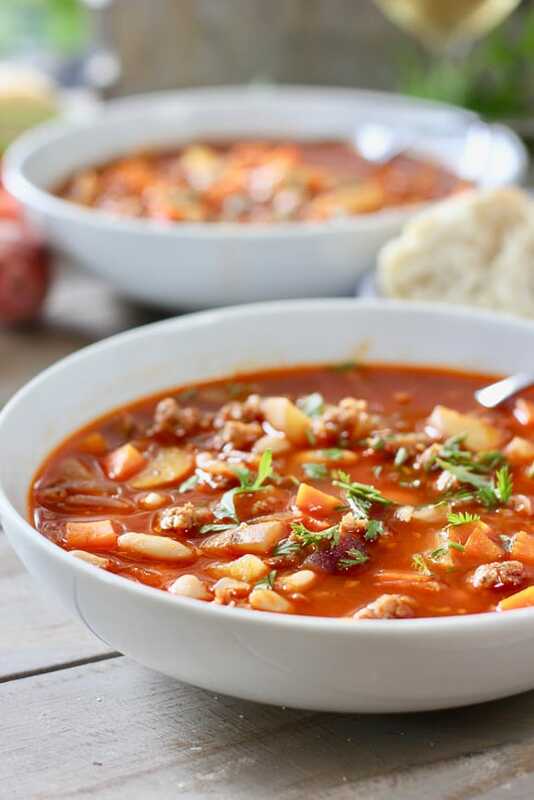 Chorizo and White Bean Soup in less than 30 minutes! Chorizo. What is it? It’s sausage! Spicy Spanish or Mexican sausage…that’s it…not too scary at all! It comes uncooked or cooked. The cooked is usually smoked. I used raw for this recipe and isn’t that a pretty picture? Oh raw meat photo…why do you make me do it? 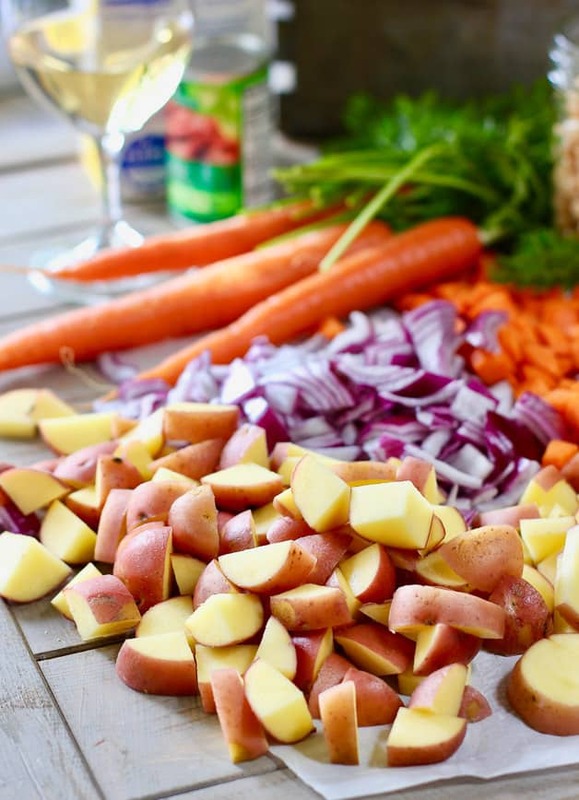 We love fresh veggies around here and this soup is a perfect receptacle for them! I used potatoes, carrots and onions. Such a simple concoction but I kid you not…the flavor is out there! This would make a great ‘clean out the fridge’ soup. You could add peppers, celery, spinach..whatever you have hanging around. Even one cup of dried pasta if you need noodles in your soup :). Substitute Italian sausage for the chorizo. Add a teaspoon or two of smoked paprika to the pot and you will get a similar flavor. 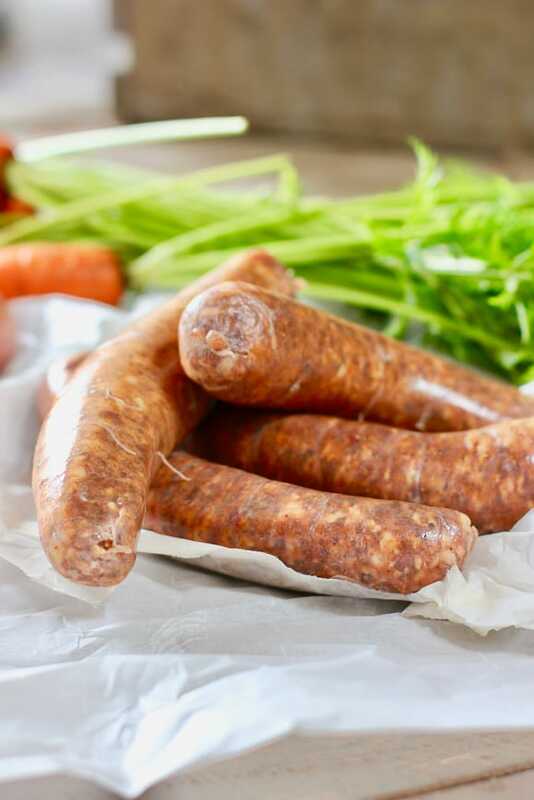 Buy fresh chorizo if you can. I am not a huge fan of spicy but this seemed to have just the right amount of kick for us. We love soup around here and you can see all of our soup recipes HERE! A couple that are near and dear to our soup loving’ hearts are Mexican Shrimp and Corn Chowder and Creamy Chicken and Wild Rice Soup. To soup and all the comfort it brings! 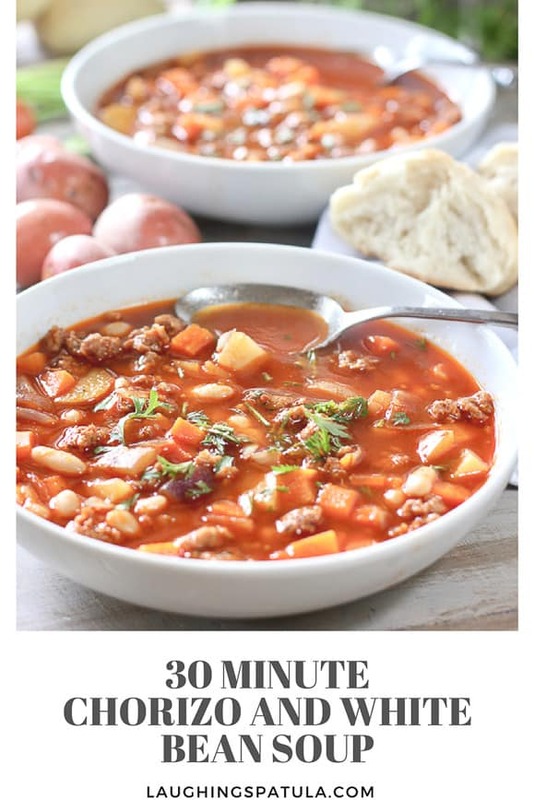 A 30 minute soup that is full of sausage, potatoes and veggies! 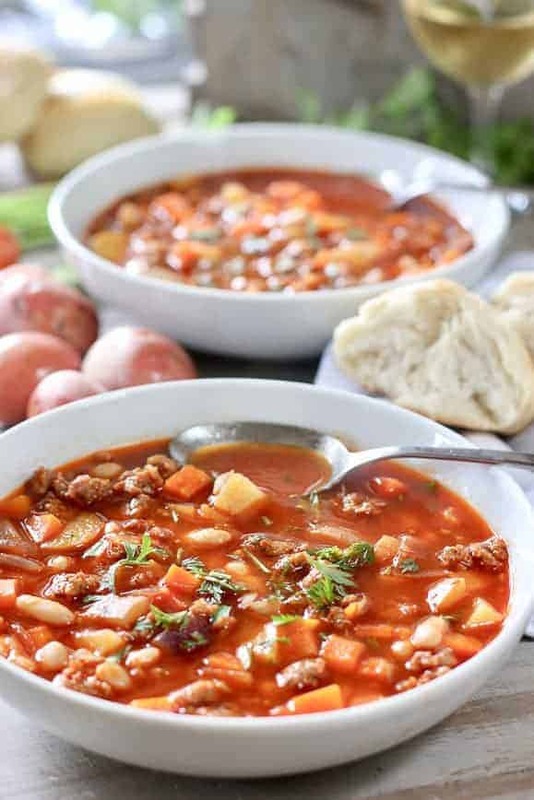 The chorizo makes a rich and spicy broth that has tons of flavor! Grated parmasan or feta as a garnish if you like! In a large dutch oven, heat olive oil. Add chorizo breaking up the sausage as it cooks. Continue to cook until crumbly and cooked through. Remove to a dish lined with paper towels to absorb some of the grease. Remove all oil from pan except for two tablespoons. Add onions and carrots to the pot and saute until tender. Add garlic and tomato paste until heated through. Add chicken broth, potatoes, chorizo and beans. Bring to a simmer and cook until potatoes are fork tender. Serve with crusty french bread and a garnish of parmesan or feta if desired. Hi Annie, I was able to subscribe you. Not sure why you had a problem but thank you for letting us know! Aloha, why does the chorizo and white bean soup contain so much salt? I’m going to use my veggie version of chorizo, great substitute. That might help a bit but there is also the chicken stock (unless you make your own) and the canned beans. 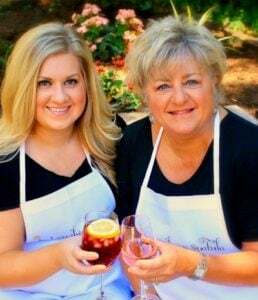 We always go for low sodium when we can do it! Hi, I came upon your site through Pinterest. I found myself bookmarking recipe after recipe then I realized I should just subscribe. However, my device won’t let me because it says it’s not secure. I’m sure it is, but you know how finicky these things can be. Please subscribe me using my email address if you can. Many thanks! 😀 P.S. this soup is on my menu this week! Hi Karen! Your all signed up! Thank you so much for your note! p.s. if you clear history on your computer it should remedy that problem :).